$1,500 (includes beverages and snacks). $750 deposit required upon booking. Remaining balance is due 90 days prior to workshop. For this workshop you will be responsible for arranging your own lodging. For those who register, a document will be emailed to you with when are where to book. Transportation is not included, we always go caravan style for this trip. Most people will fly into Vegas and rent a vehicle to drive up to Springdale which is where we meet for our first day of shooting. If you are looking for a closer airport option, you can look into the St. George, Utah airport. It is rather small, but it may be a good fit for some people. The drive from Vegas to Springdale is 3 hours. From St. George to Springdale, it is one hour. Beyond the learning aspect of this workshop, remember that we live in this landscape. 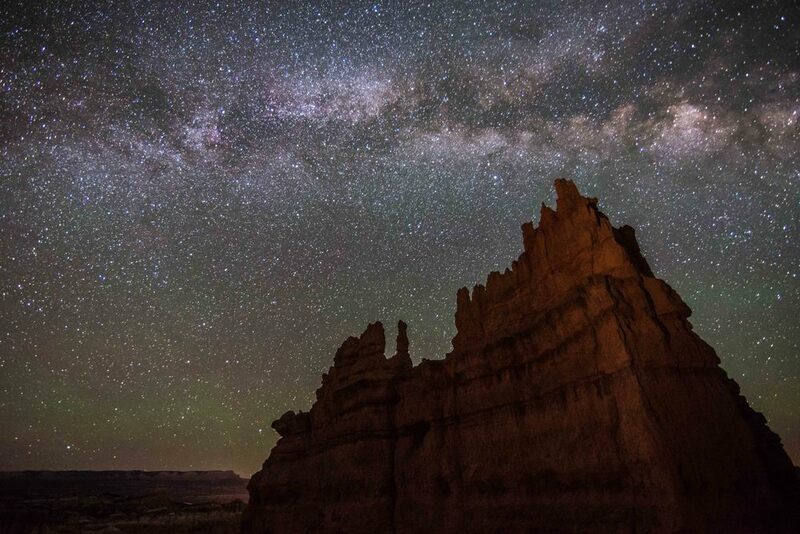 We have scoured these areas in day and night time hours, and have become specialized in knowing the very best shooting locations for Milky Way season. We will get you to the goods. Photography experience requirements: None. This trip is appropriate for beginner to advanced photographers. Physical requirements: The most physical event of the trip is hiking down into Bryce canyon. We will hike approximately 1 mile downhill, and return out of the canyon on the same trail for a total of approximately 2 to 2.5 miles total. Elevation gain for the hike out of the canyon is 623 feet. Beyond this hike, all of our other shooting locations are very short approaches on flat level ground. Camera equipment requirements: You will need a camera that can shoot at ISO’s of 6400 or above, as well as have a wide angle lens with an aperture of f2.8 or wider as well as a sturdy tripod. Astrophotography requires higher end gear in order to be successful. The better the camera and lens you have, the happier you’re going to be with your images. That is why for this workshop we recommend professional level setups. If you do not have a professional level camera and lens, we would recommend renting a setup and will help you in that selection process. This is not required, however, we know that these setups will make you much happier with your images. 4:00 PM - Meet at Cafe Soleil in the town of Springdale for a coffee, tea and snacks meet and greet. We will meet the instructors and participants involved in our 4-day outing. This is a great time to talk about local secret spots, recommendations for solo-time shooting in Bryce and Zion, logistics of your trip, gear, etc. And then onto sunset shooting! We'll chase whatever is looking the best with the current conditions in the park and will shoot through sunset. Post-sunset: Break for food. People can travel to their restaurant of choosing. We have recommendations. 9 PM - Oh yeah! Onto the good stuff. By this time, the sky is going to be DARK and one of the very best nights for milky way photography of the entire year! Expect around 4 hours of shooting. We will photograph 3 to 4 different areas. 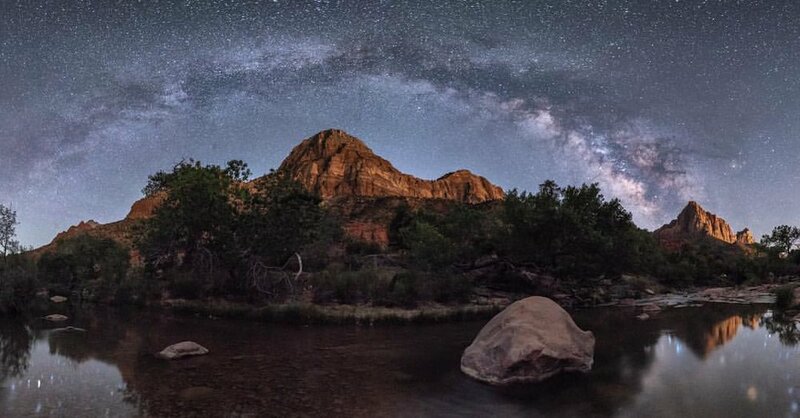 On this evening we learn how to expose perfectly for the night sky, and photograph some of Zion's dramatic cliffs, as well as a local ghost town. 5PM - We load up in Springdale (just outside of Zion) and caravan up to Bryce National Park. After the 2 hour drive to Bryce, we will photograph the last hour of light in the canyon. Bryce is actually not optimal with sunset light due to the positioning of the canyon with the setting sun, it is very much a sunrise location. However, if we get lucky with conditions you can get some great images. Post-sunset, when “earth shadow” light is happening we can get some nice, well balanced exposures with nice color. After sunset we’ll roll over to a local restaurant and grab a bite to eat before going back out for astrophotography. Bryce has a reputation of being one of the darkest skies in the lower 48. So dark that we have seen events similar to the aurora borealis! Combined with the bizarre, and beautifully colored rock, along with a perfectly positioned Milky Way, we’re going to get some great images here. Again, we will likely be out for around 4 hours or so. 11AM - We'll have a nice leisurely morning and will meet for a late breakfast/early lunch. This afternoon is for personal exploration and shooting time. I have some nice recommendations for photography areas in the afternoon. Many people typically take advantage of a nap during this afternoon, as we have spent many nights awake into early morning hours. After checking out and eating, the group more or less splits on their drive over to Escalante. There are a couple of state parks that people will enjoy on the drive over. Those are “Petrified State Park, and Kodachrome State Park”. 4PM - We will meet up for some food before we go out for a combo of sunset and milky way photography. Our last evening of night photography. We are going to play with light painting and star trails. With Doctor Suess-esque hoodoos, and large natural arches, we are going to get some great stuff here. Expect to photograph for around 4 hours. 11AM - Another leisurely wake up and meeting after a late night of shooting. For those interested in post-processing techniques, we will sit down together while still in Escalante to learn some helpful tips on processing your images using Lightroom, StarStax and Starry Landscape Stacker (or Sequator for PC users). Expect around 3 hours of processing time. From here we will depart and people will go there separate ways. For those wanting to spend a couple of extra days in the Southwest, Capital Reef National Park is only one hour away from Escalante. Other options will be recommended to those who book and are looking for some extra shooting while in the area. Questions or ready to register?